HELP US: The 20th Century Electric Railway Foundation has provided a Challenge Grant to save our Brussels Tram Collection. Your Donations could be doubled. Click here to learn more! The OERHS owns and operates the Oregon Electric Railway Museum, the largest Trolley Museum in the Pacific Northwest. It is conveniently located just off of I-5 in Brooks, Oregon. 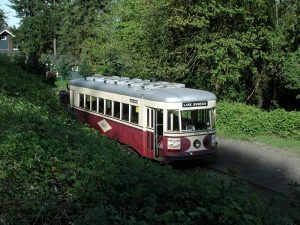 The OERHS is under contract to operate the Willamette Shore Trolley. This is a tourist trolley line that runs along the Willamette River between Portland and Lake Oswego for a distance of 6 miles. OERHS is an Oregon Non-Profit Public Benefit Corporation. It is recognized by the IRS as a Non-For-Profit public benefit Corporation under Section 501(c)3.